Refinishing hardwood floors is a job best left to the professionals. Refinishing hardwood floors is a job best left to the professionals. However, there are some homeowners who really prefer to do things themselves. 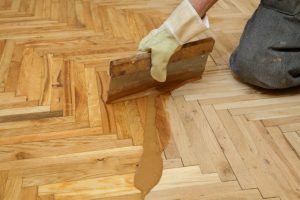 We are here to offer some words of caution, as refinishing your hardwood without professional help can have disastrous results. Here are a couple of things you should look out for if you decide to go it alone. A drum sander is a powerful piece of equipment. If you leave it in one spot for too long, it can create uneven areas in your floor that will definitely cause some problems. If you’re not careful, your refinishing project could turn into a flooring replacement! If you’re going to try to refinish your hardwood by yourself, keep that sander moving but watch your speed. Too slow and you risk staying in one place for too long, but if you go to fast, you can miss spots and your floor will be uneven. If you’re at all unsure, call the pros at Jason Brown Wood Floors and we will get it done right! Most belt sanders will vacuum up around 90% of the dust that they create, but you need to be careful about the remaining 10%, because it will get everywhere. Be sure to go over the sanded surface multiple times to ensure that no dust remains. Even the smallest bits of dust can cause blemishes in your otherwise perfect, smooth finish. One of the biggest mistakes handy homeowners make when they do their own refinishing is not giving the finish enough time to dry. Just because it feels dry when you touch it after about an hour doesn’t mean that the flooring is ready to be walked on. The longer your new finish is allowed to dry, the better your results will be. This entry was posted on Thursday, November 16th, 2017 at 3:08 pm. Both comments and pings are currently closed.